If you've looked out of an airplane window while flying over the central or western United States, chances are you saw lot of the "little" circles on the ground. 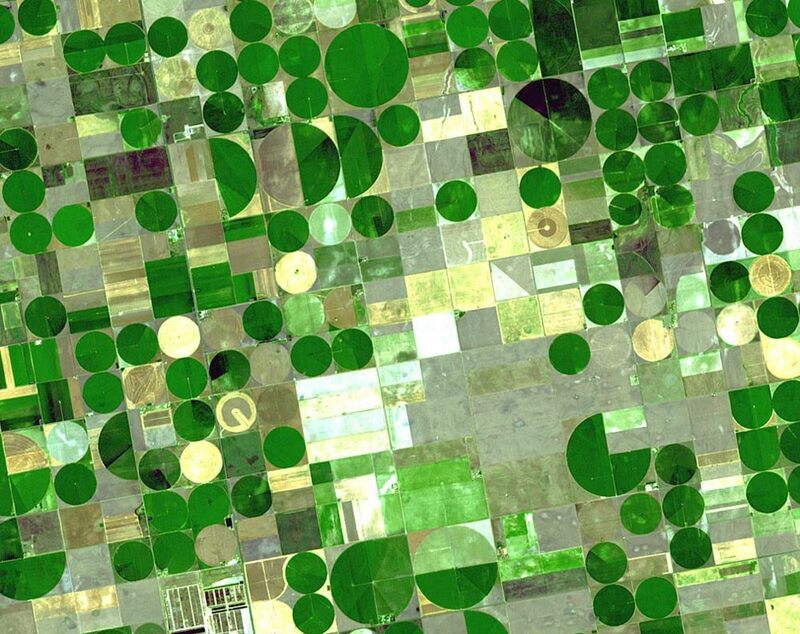 They are center-pivot irrigation circles, this set being in Colorado. In these systems, water is pumped from an well in the center of the circle from an underground aquifer and distributed through a giant sprinkler hundreds of yards long that pivots around a central point. In the past, large spray guns were used to shoot water through the air onto the crops, but nowadays more efficient low-pressure sprinklers hang from the pipes to spray water close to the ground, which is a much more efficient method that saves water. This NASA satellite photo shows crop circles in Finney County, Kansas. These irrigated plots are 800 and 1,600 meters in diameter (0.5 and 1 mile). This area utilizes irrigation water from the Ogallala aquifer, that underlies an area from Wyoming to Texas.